Photo by Big Mind Zen Center. 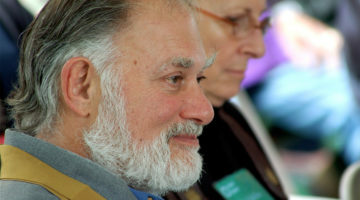 Roshi Bernie Glassman, an American Zen original, leaves behind his success at Greyston and takes on the challenge of peacemaking. Always challenging, always surprising, Roshi Bernard Tetsugen Glassman is one of the most provocative figures of American Buddhism. An aeronautical engineer who began his Zen practice in the late fifties, Glassman is one of the dharma heirs of Taizan Maezumi Roshi, and upon Maezumi Roshi’s death, was given charge of his worldwide sangha. Yet it seems the life of the settled Zen teacher cannot satisfy the restless, visionary mind of Roshi Bernie Glassman. At his base in Yonkers, New York, he established a multi-faceted social service agency called the Greyston mandala, showing a capacity unique in the Buddhist world to attract high profile supporters and millions of dollars in public funding. Glassman and his students plunged into the streets of New York City to experience the life of the homeless firsthand; they sat in meditation at Auschwitz to bear witness to the crime of the millenium. Out of these powerful experiences came the three tenets of Glassman’s newest project, the Peacemaker Order: Not knowing, thereby giving up fixed ideas about ourselves and our universe; bearing witness to the joy and suffering of the world; and healing ourselves and the universe. The Peacemaker Order bears the marks of Glassman’s previous work: a small start, a strong interfaith component, and a big, big vision. Right now there are only fifteen members of Glassman’s own Zen Peacemaker Order, but he envisions a much larger Peacemaker community comprised of networks of Peacemaker Villages of many faiths around the world. The Peacemaker Order is co-founded by Roshi Bernard Glassman and Sensei Jishu Holmes, who is his wife. I spoke to them at their offices in Yonkers. Melvin McLeod: Both of you have been working until recently on the social service projects at Greyston mandala in Yonkers, which would seem like a very worthwhile thing to continue doing. Why have you moved to this new project, the founding of the Peacemaker Order? Sensei Jishu Holmes: Greyston has now entered into an operational mode, rather than the entrepreneurial beginning stages, and for both of us, that’s not our forte. We’re more involved in the creation and development of projects, rather than running them. Once an organization is in the operations mode, it’s not as open to taking risks with new ideas. So it seems that for us to do the things that we do best, we need to go in a different direction. Melvin McLeod: Why did you choose this particular direction? Sensei Jishu Holmes: This came out of Bernie’s fifty-fifth birthday party in Washington, D.C.
Roshi Bernard Glassman: Yeah. At my fifty-fifth birthday party three and a half years ago, I decided that I would spend a week or so sitting on the steps of our Capitol, one of the energy spots of this nation. I would do a retreat there, asking myself what would be my next step in working with rejection, violence and, specifically, AIDS, because that was at the beginning of our AIDS work. I invited people to join me if they wished to pose the same questions; that would be the koan we would share. It turned out to be the coldest week in Washington D.C. in fifty years. We slept at night at a local shelter, one of the largest shelters in the country a few blocks from the Capitol. It was really packed all the time and we slept in the huge dining hall on the floor. At that retreat came the answer to my question—that I was going to start a peacemaker order. So that was the initial seed of this peacemaker order, and I started visualizing an environment, a friendly space, for those doing this kind of work, and those wanting to do this kind of work. Later I went on vacation with Jishu, and during that vacation we talked a lot about our lives and the fact that in some way our work was taking us away from each other, that we were leading very different lifestyles. We decided to co-found this peacemaker order. As a team, we complement each other and we provide a lot of problems for each other. I’m basically the visionary and she starts creating forms out of those visions. We’ve been exploring and experimenting and having a hard time figuring out what it means to be co-founders. I get so much notoriety and I’m very aggressive and pushy. I change very rapidly; she’s more consistent. What does it really mean to be co-founders? There’s a lot of stuff there; it’s very difficult. Melvin McLeod: Although we do think of activism as a calling for some people, and as a spiritual impulse, why do you speak of an “order” of peacemakers? 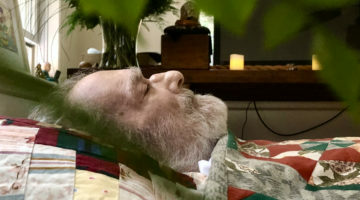 Roshi Bernard Glassman: The reason we chose the word “order” was to make it very strong that our actions are very deeply informed by spiritual practice, rather than meaning that one needs to be a monastic. The concept of priesthood in Zen, at least in the Rinzai style, is very lay oriented, and of course these days everybody uses the word Zen in such a secular way. But we definitely wanted to make it clear that the peacemaking we were going to do was going to be based on precepts—that it was going to be based on the tenets we have of not knowing, bearing witness, and healing. It comes out of spiritual practices. Melvin McLeod: The word “order” implies a level of commitment that isn’t always found in political or social work. Roshi Bernard Glassman: Yeah, that’s true. We’ve been exploring that and have come up with three levels of commitment. One is members of the order, and those people we’re asking for a heavy commitment—financially, spiritually and physically, a lot of time and energy. If you’re a member of the order, this is one of the dominant forces of your life. At the other end of the spectrum are people to be installed as peacemakers with no commitment except to take seriously the tenets of penetrating into the unknown, bearing witness and healing, and try to integrate them into their lives. Also to have at least a day of reflection once a month. In between we’re looking at a middle ground of people who want to get a little closer to being actively involved. The middle ground we really haven’t clarified yet. Melvin McLeod: Is your goal primarily to teach spiritual principles in a social action context or do you hope to build a substantial network of activists on the ground? Roshi Bernard Glassman: Yeah, we’re hoping to. We’re linking together activists who are already operating this way. There are folks around the world doing this kind of work and my hope is to support them, and also support others who would like to do this work by having them intern in the different places, or by us running programs and workshops. When I say workshops I mean something almost like abhisekas, in that part of a workshop has to be the reality of doing the work itself. We’re not looking at creating more programs about it, but showing by example how to do it. There already exists a large network of people who have expressed to me their interest in having such a community. They may have come out of a particular sangha, but when they started to do this type of work, they sort of lost their sangha because they were looked at as being a little different. Now they’re looking for a sangha of folks who are working this way. Melvin McLeod: Tell me about some of the people who you are bringing together. Roshi Bernard Glassman: At this point we have the initial members of the Zen Peacemaker Order who have been installed and who are interested in forming what we’re calling a village, either in a virtual village way or in a physical location. They include writer Peter Matthiessen; peace activist Claude Thomas; Joan Halifax; Zen teacher and AIDS worker Pat O’Hara; Reverend Francisco Lugovina, who works in inner city development in the Bronx; Andrsez Krajewski, who will focus on peacemaker projects in Poland, and Bhante Suhita Dharma, who works with homeless people with AIDS. We also have people who aren’t Zen practitioners, and that’s another network we’re calling the Interfaith Peacemaker Assembly. They’re not joining any particular order, but we are connecting together. Some of those people you know, such as Jon Kabat-Zinn, Tsultrim Allione, Bo Lozoff. Melvin McLeod: What do you expect this community of peacemakers to do for its members? 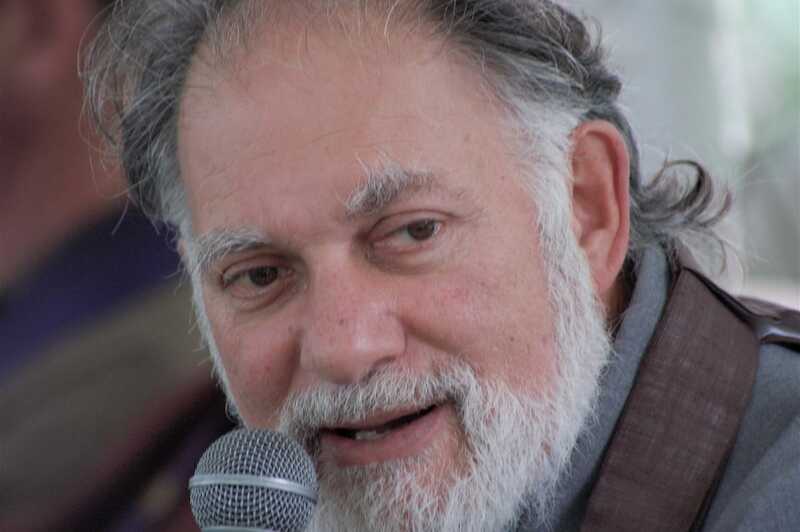 Roshi Bernard Glassman: We would have celebrations where we could share our stories so that it becomes a peer relationship and an encouragement. We would also have places where their students or members of their community could go into internships in other places. For example, Bo would love to have some people come and do some internships in what he’s doing, which is prison work. Most of Joan Halifax’s work is in death and dying, but she does work in wilderness and survival and vision quests, and she’d love some of those people to come into the inner city to do some street work. I’d love some of our people that do street retreats to see what it is like to do a vision quest. There’s a group in Italy that’s an umbrella for social action for dharma students. They’re starting hospice work and they would like to have people train with Jon Kabat-Zinn. We have a Polish sangha which is starting hospice work and Joan’s going to do workshops for them. Locally we have a member of the Peacemaker Order who is Puerto Rican and has been doing a lot of work in the southwest Bronx and the Latino communities for a long time. He wants to build up villages with these tenets. There’s a woman in the bottom of Manhattan who’s working with gay and lesbian groups and AIDS work. There’s Peter Matthiessen, who does Native American work and environmental work. So there’s a spreading of methodologies across these places. People will share experiences across these different types of activities. Melvin McLeod: What practical methods do you have to teach people your tenets, or three-fold process? 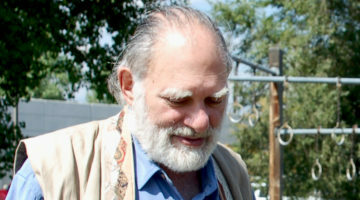 Roshi Bernard Glassman: We just finished a four week intensive study in which we worked a lot with these three tenets. Of course they’re very Buddhist, but I think they make sense in all mystical traditions. The first is penetrating into the unknown: essentially these are practices that help you to let go of your fixed ideas. In Buddhism we have meditation as one way of letting us drop our attachments, our ideas. In Zen, koan study was developed as a method of trying to get you to let go of your ideas. I’ve instituted practices of taking people into situations like Auschwitz or living on the streets, where it is so overwhelming that you lose control of your attachment to the idea of ego. You’re put into a situation where you just don’t know anymore what’s happening; it’s an overload of the system. Melvin McLeod: A social koan. Roshi Bernard Glassman: Yeah. There are many practices developed in the different traditions to try to get you to that place. Let’s say it’s mahamudra. We have many terms for that space once you’ve arrived there. In Zen it’s shikantaza, where you have no idea: you’ve let go of your particular ideas and what’s left is just that space of not knowing. In many traditions that’s also called the source, that which can’t be named. So that’s our first tenet and we will work with people with practices of how to do that. So in some concrete terms, if you want to do work with the homeless, we’re asking that you forget all the methods that you know about. Not that you throw them out; they’re there somewhere. But first drop all the ideas that you know how to take care of the situation you’re about to enter. Enter the situation with the mindset that you have no idea how to take care of it. The villages are made up of groups of people who are in tune with these principles. Joan Halifax, for example, takes people up to wilderness retreats. I think the same thing happens: you’re in a situation where you just don’t know how to handle things, and you wind up in the space of unknowing. Then the second step is bearing witness. Sit with that situation; bear witness to it. And what we’re saying is that the third step of healing oneself and others, which I would say is a metta or loving action step, will arise naturally out of that bearing witness. So we’re asking that it not stop with saying, well, I want to penetrate into the unknown and I’m not going to do anything until I achieve that state. We’re saying you’ve got to do all three things. You’ve got to penetrate into the unknown to the best of your ability; but independent of how well that’s done, then bear witness to the situation. Melvin McLeod: To the suffering. Roshi Bernard Glassman: It could also be joy. I would want to have people train as clowns, for example. Abstract theatre is a world they probably have no idea about. Think back to some of the things Trungpa Rinpoche did in terms of theatre work. I’m very interested in the same stuff as ways of taking us out of our space of thinking we know what’s going on. When I first started the street work, a friend of mine, Jim Morton, then dean of St. John the Divine who had done this kind of work back in Chicago in the sixties, told me the biggest teacher when I got out there was going to be the unknown. Whatever ideas people have of what’s going to happen when they go out, they’re wrong, and what they learn will be from the unknown. That’s always been the case; I think charnel ground practices are very similar. Melvin McLeod: Is your goal to bring spiritual values to the activist world by teaching these three tenets, or is it to bring activist values to the spiritual world, or is it the belief that these tenets simply represent the most effective way to act under any circumstances? Sensei Jishu Holmes: I would suggest the latter. It’s a way of approaching any situation. Roshi Bernard Glassman: Yeah, I would agree with Jishu on that. I also have a personal goal, at least in terms of the Buddhist world. I’ve met so many people in this country and in Europe who I think have the wrong impression that the dharma world and social action need to be separate. They’re not seeing it as practice, as one and the same. I think that’s changing, I mean, I know it’s changing, but I do as a teacher have this goal of showing how this is practical to the dharma world. Also it’s my feeling that a lot of social activists would benefit from this approach because it takes away the duality of the situation. When you go out on the street, you’re not going there to fix any situation. You’re going there to bear witness, and when you do, all of a sudden you can feel what it’s like to be served by different approaches, and you know personally what works and doesn’t work. You can feel it. I would say it’s an experience that everybody would benefit from. Melvin McLeod: You have also adopted four principles from the last World Congress of Religions, which are commitments to a culture of nonviolence and reverence for life; solidarity and a just economic order; tolerance and a life based on truthfulness; and equal rights and partnership between men and women. If your tenets constitute the method, it seems these commitments could represent the goal. Roshi Bernard Glassman: After many years of work, these were the four areas, four commitments, that some two hundred world religions could agree on. These were the only four. All of our work is very inclusive and we operate in the interfaith world. So here were four commitments that two hundred religions could agree on, and we decided, let’s start from this basis of what they could agree on, and see how that informs and affects our work. One of Jishu’s ideas was to take these four commitments and actually divide the year into quarters by focusing on each of them in turn and looking at how we apply them to our work. In our Zen community, for example, we’re looking very concretely at partnerships in terms of male and female energies. Melvin McLeod: In practical terms, in five or ten years, what do you hope to see this peacemaker community as? Roshi Bernard Glassman: What flashes in my mind is Indra’s Net—many communities doing this kind of work around the world supporting each other, sharing what we’re doing. It’s important for us to figure out ways to communicate and share and to support each other. At first I had thought of this as a container for people in the buddhadharma to do this work, because I was approached by so many folks like that. But now I see it much broader. I really think there is a spirituality beyond all these particular religions and that we’re moving towards that. Groups in many traditions are coming from the same basic place of the oneness of life, the interconnectedness of life, and the place of not knowing. I can see this happening all over the place and I see us spinning together a web of support. That’s what I envision. Melvin McLeod: What do you think the potential is in terms of numbers? How many people around the world are working this way? Roshi Bernard Glassman: I’ve been approached by people representing maybe twenty to thirty potential villages now, each of those representing hundreds of people, sometimes thousands. There’s one Soto priest from Japan doing work in Cambodia and Laos and he’s got three thousand members. So I don’t know; I think we’re talking in tens of thousands. Melvin McLeod: Yet it strikes me that more than actual numbers, the spreading of your tenets, of this fundamentally dharmic method of action, is potentially the most powerful effect of this project. Roshi Bernard Glassman: Yeah, I think so. And that’s where we’re putting our emphasis, though we’re contemplating spending time in different villages that are emerging. Our member Eve Marko would like to create a village in Israel, where I’m going to be having discussions with His Holiness the Dalai Lama. He’s preaching this to the world, but he doesn’t have that many forms for doing this kind of work. So we’re going to be talking hopefully about that. Melvin McLeod: A spirituality that goes beyond religion. Roshi Bernard Glassman: Yeah. This is in the air. There’s many wonderful people talking this way. It wasn’t like this ten or fifteen years ago. The Dalai Lama wasn’t saying this ten years ago, but he certainly is now. Thich Nhat Hanh is talking that way. There are so many folks. But when we go to do the work, I think the first thing to do is to work on these three tenets. What does this really mean? How do you do this? That’s the groundwork.